This article is about the 2017 sports car. For its 1960s–1970s predecessor, see Alpine A110. The Alpine A110 is a rear mid-engine, rear-wheel-drive sports car introduced by French car manufacturer Alpine at the 87th Geneva International Motor Show in March 2017. Deliveries began in late 2017 for Continental European markets, and in 2018 for the UK, Japan and Australia Both in name and design, the new A110 harkens back to the original Alpine A110 produced from 1961 to 1977. Based on an all-aluminium construction, the A110 is powered by a 1.8-litre turbocharged gasoline direct injection 4 valves per cylinder inline-four engine mated to 7-speed dual clutch automatic transmission manufactured by Getrag. Developed by Renault–Nissan and reworked by Alpine engineers, the engine has an output of 252 PS (185 kW; 249 hp) at 6,000 rpm and 320 N⋅m (236 lb⋅ft) of torque at 2,000–5,000 rpm. 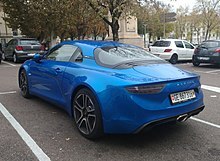 According to Alpine, the A110 can accelerate from 0 to 100 km/h (0 to 62 mph) in 4.5 seconds, and has an electronically limited top speed of 250 km/h (155 mph). The A110 is available in three trims: Pure, Première and Legende. The Pure cars, the base trim, have 17-inch alloy wheels. The Première trim cars are technically the launch edition models which were limited to 1,955 units and were equipped with amenities such as forged alloy wheels, quilted leather Sabelt bucket sports seats, a reversing camera and metallic blue exterior colour as standard. The Legende trim cars come with six way adjustable sports seats, black or brown leather interior upholstery and an upgraded hi fi sound system along with specially designed wheels exclusive to this trim. All of the three trims share the same power train and transmission. James May remarked on the Alpine A110, pronounced (‘Alpeen’), "It has 248bhp, weighs the square root of diddly, and is the greatest thing to come out of France since the Mouli cheese grater." May ended up buying an Alpine in Mid 2018 referring to it as his car of the year. The A110 Premiere Edition appeared in Gran Turismo Sport via a February update alongside the original model. ^ a b c d e f g Toma, Sebastian (7 March 2017). "Alpine's Reborn A110 Fully Revealed, It's The French Answer To The 718 And 4C". autoevolution.com. Retrieved 16 March 2017. ^ "Alpine A110 confirmed for Australia | CarAdvice". CarAdvice.com. Retrieved 6 November 2017. ^ Kew, Ollie (21 November 2018). "All of the Alpine A110 Premiere Editions are now finished". Top Gear. Retrieved 8 February 2019. ^ "Top Gear Hosts Narrowly Escape Fire"
^ "Fast cars 'still not fast' | DriveTribe". DriveTribe. 21 May 2018. Retrieved 22 May 2018. ^ "The mountain goat with turbo hooves | Sunday Times". Sunday Times. 3 February 2019. Retrieved 7 February 2019. Wikimedia Commons has media related to Alpine A110.